PriceMole is an intelligent competitor price tracking platform. 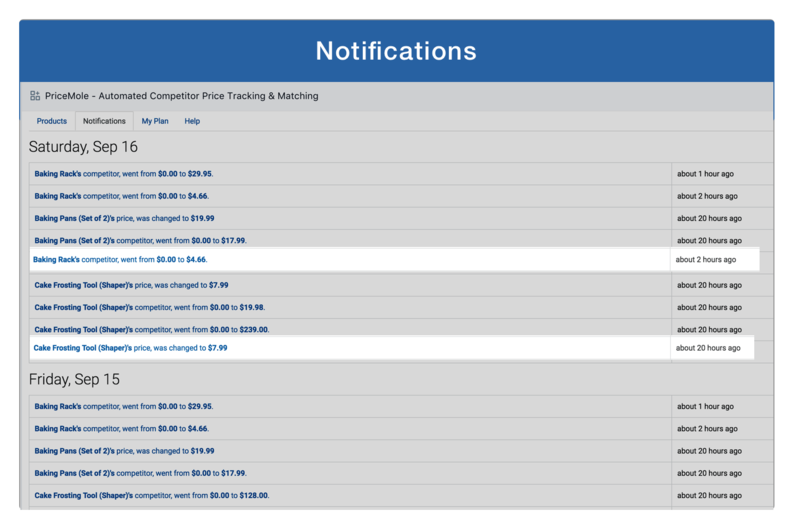 It lets you keep an eye on all your competitors prices, notifies you about each and every price change, even instantly. 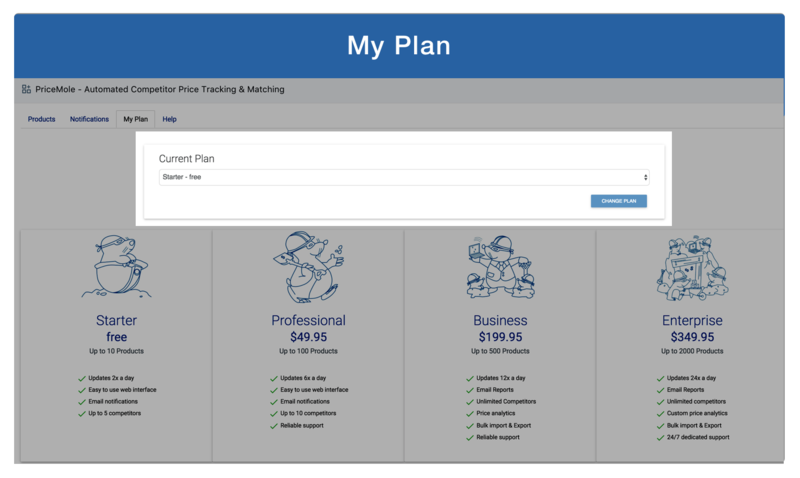 With our Pricing Strategies, you can automate your response and choose to match, beat or challenge your competitors prices.You can try an unlimited time FREE trial today! 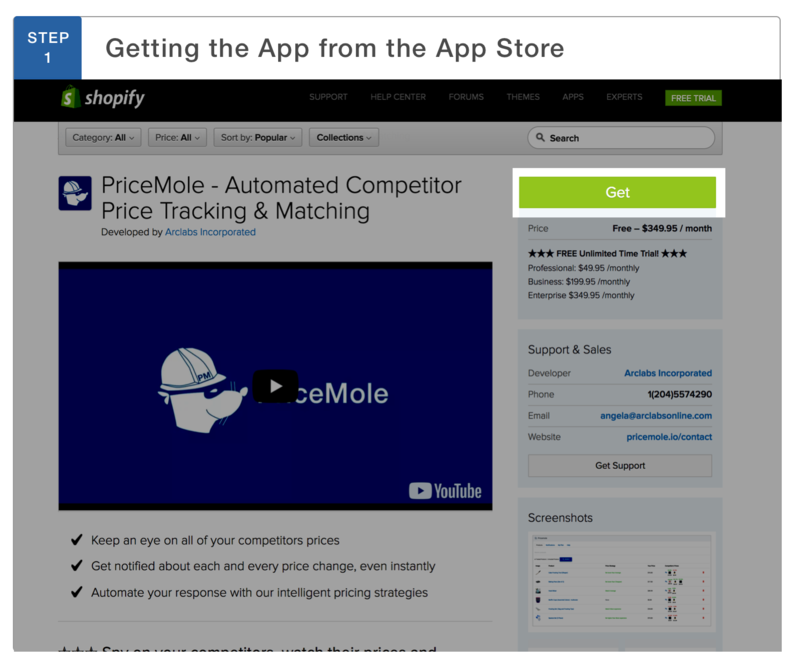 Head over to the Shopify App Store and search for “PriceMole”. You can then download the app by clicking the “Get” button. Shopify will take you to the Install screen. It’s as simple as pressing the button “Install app”. 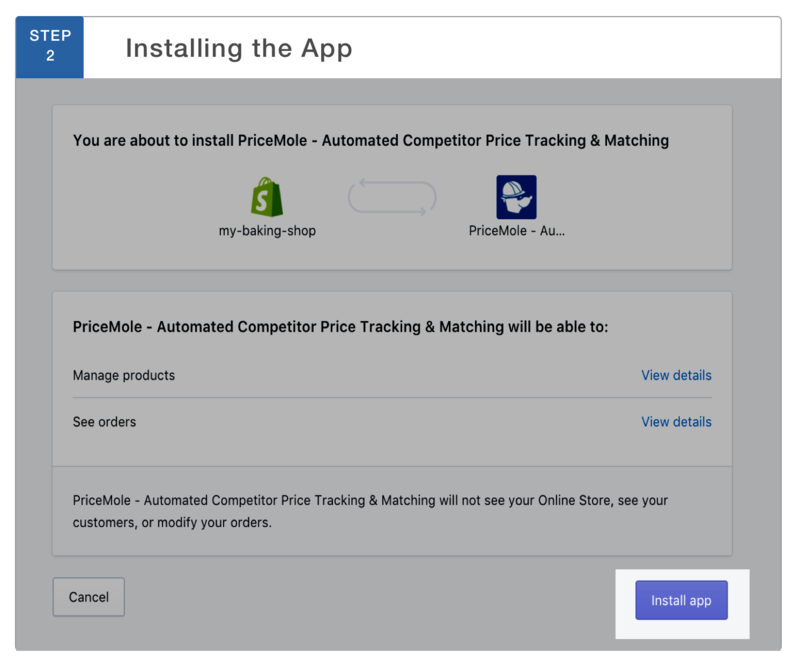 To open the app, double click on the Mole Icon or the Title: “PriceMole -Automated Competitor Price Tracking & Matching. Once inside the app, you will need to import your stores products into the app. Do so by clicking: “Refresh this page” and all your products will magically appear. First select a product you would like to track. You can use the search bar to find a specific product you are looking for. To being tracking click the “Track” button. 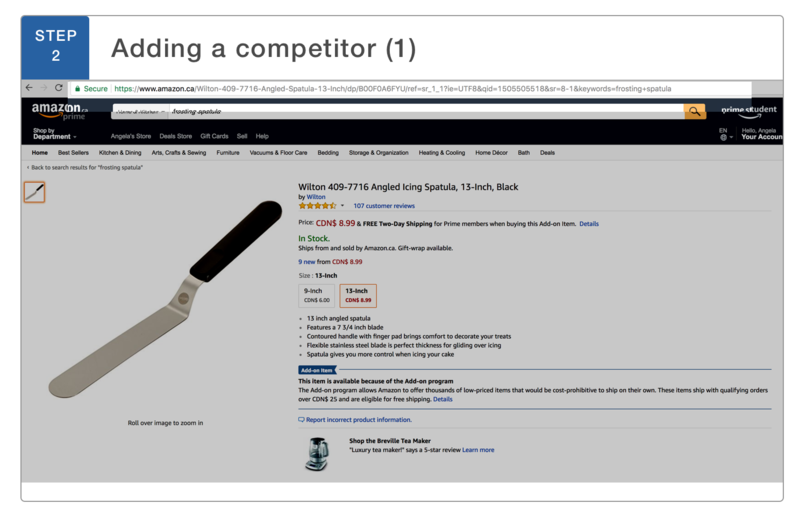 When adding a competitor there are two different possibilities: A known domain and a new domain. We will discuss both cases here. 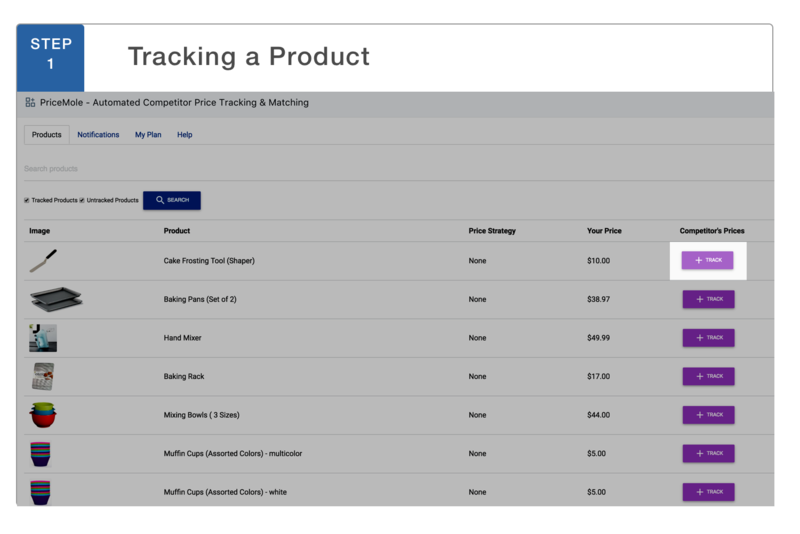 Head over to your competitors page, and find the product you would like to track. You then need to copy the full URL you see at the top of your page, for example: https://www.amazon.ca/Tablet-Stand-Multi-Angle-Lam... (make sure you include the full URL to the product where price information is visible). Now go back to the app, where you had selected a product to track. In the middle of the page, you can paste the URL you just copied into the form. 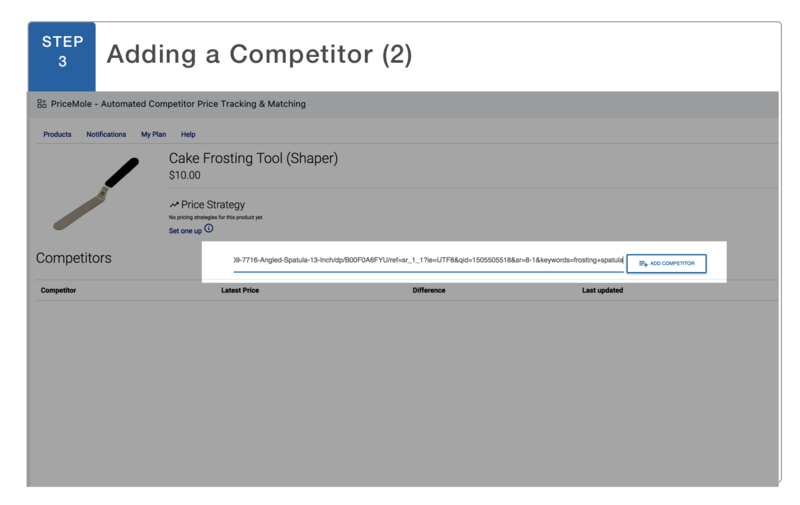 Then hit the “Add Competitor” Button. This means, your domain is known and the prices should update within minutes. This means that you have added a domain that is new to our moles. They will start scraping the web and update your prices within hours. 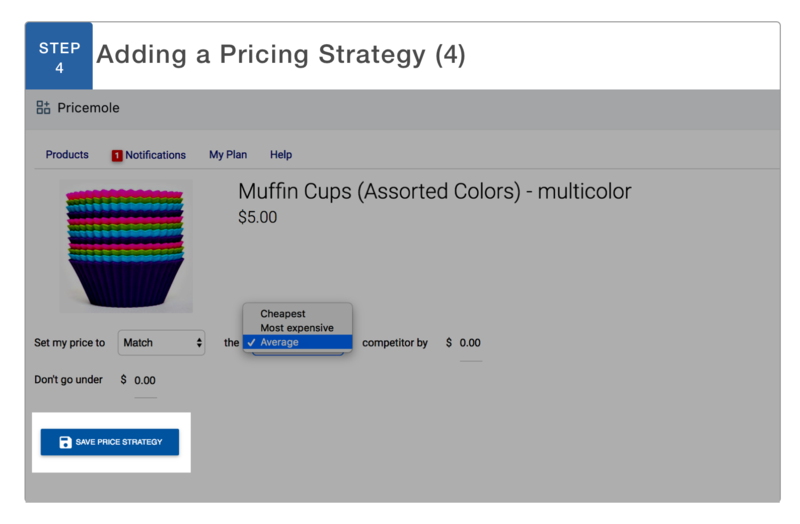 In the middle of the page you will find a section called pricing strategy. Click on “Set one up” to get started. 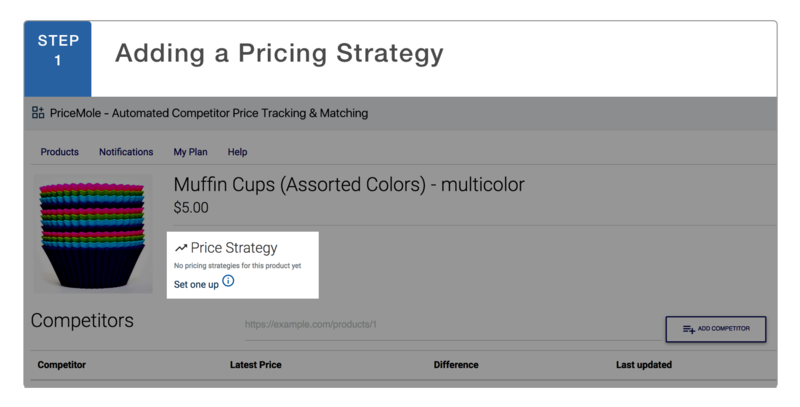 Adjust the strategy to match your preference for example: Set my price to be higher than the most expensive competitor by $2.00; Set my price to match the average competitor; Set my price to be lower than the cheapest competitor by $1.00, etc. You can also set a minimum price for your products, so the app never sets a lower price than you expected by adding a value to "Don't go under _______." 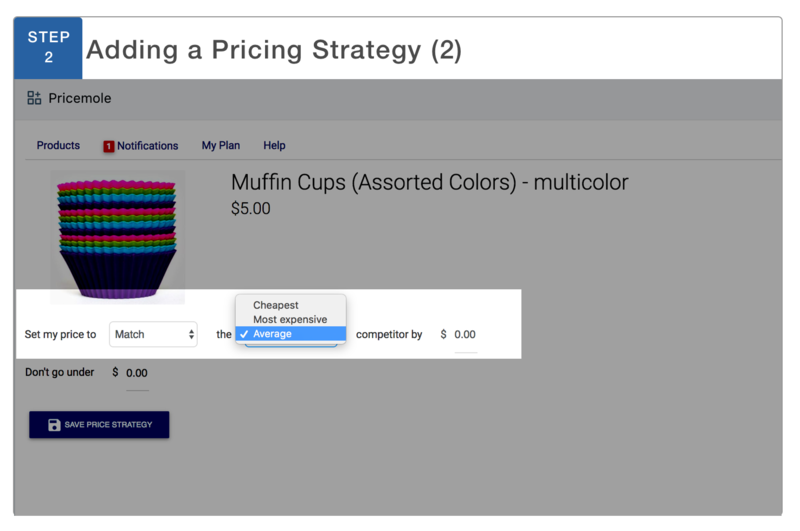 One last step is to save the pricing strategy by clicking the "Save Strategy" Button. It can take anywhere from 5 minutes to 12 hours to take effect, depending on the type of plan you have selected (more information about changing and or upgrading plans later). The Notifications tab shows you all of the price changes being made in the app. When your competitors prices get updated from $0.00 to a value, when their prices change and also when the app adjusts your prices according to your pricing strategy. 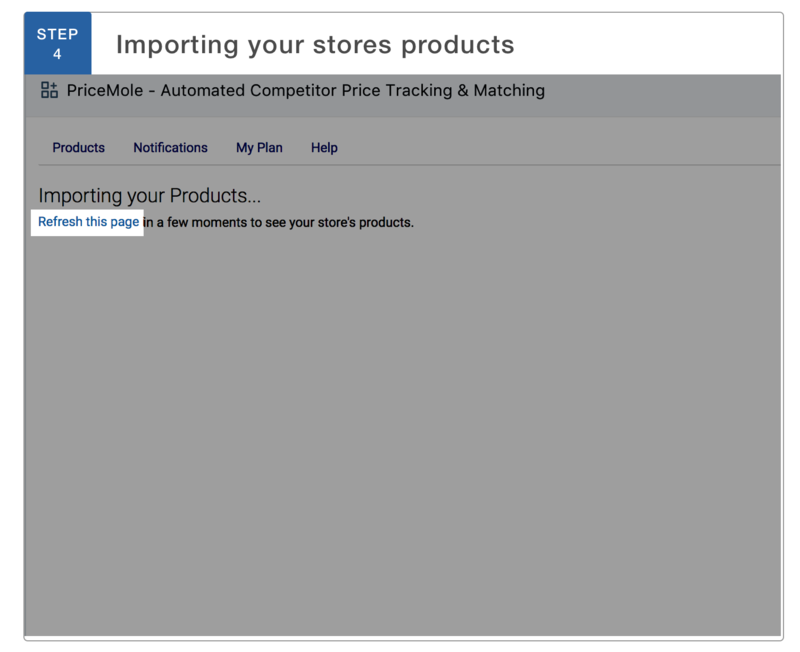 You can click on the product or competitor to go to the respective pages. My Plan allows you to change your plan. When you sign up you will automatically be using the free plan. All prices are updated 2x a day, accessible on an easy to use web interface, with price change notifications and automated price adjustments. Add up to 10 Products and 5 competitors per product. All prices are updated 6x a day accessible on an easy to use web interface, with price change notifications and automated price adjustments. Add up to 100 Products and 10 competitors per product. All prices are updated 12x a day accessible on an easy to use web interface, with price change notifications and automated price adjustments. Add up to 500 Products and an unlimited amount of competitors. Gain access to pricing analytics and reports. All prices are updated 24x a day accessible on an easy to use web interface, with price change notifications and automated price adjustments. Add up to 2000 Products and an unlimited amount of competitors. 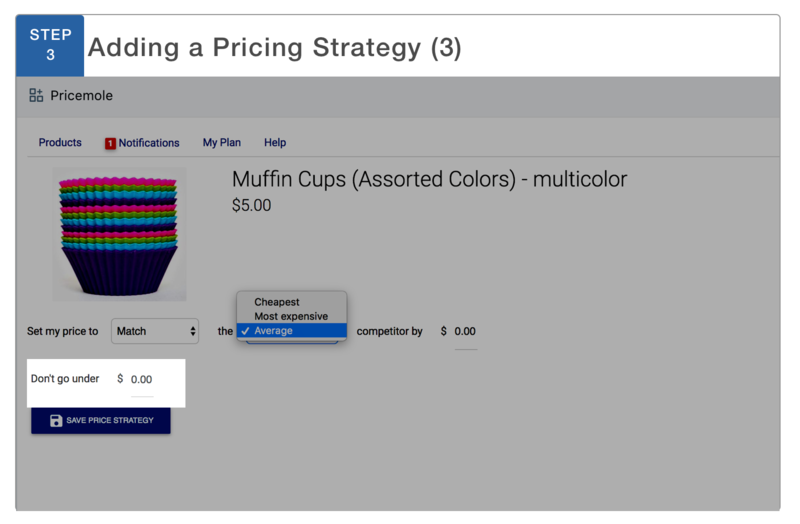 Customize your pricing analytics and reports. ☞ Do you have more than 2000 Products you need to track? Contact us today and we can create a custom plan just for you! 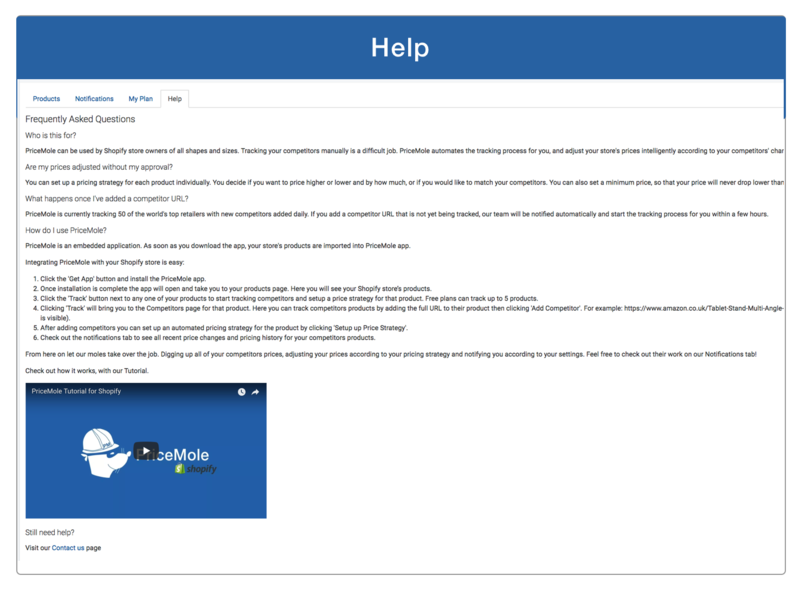 The Help tab gives you the basics about installing and using the app. 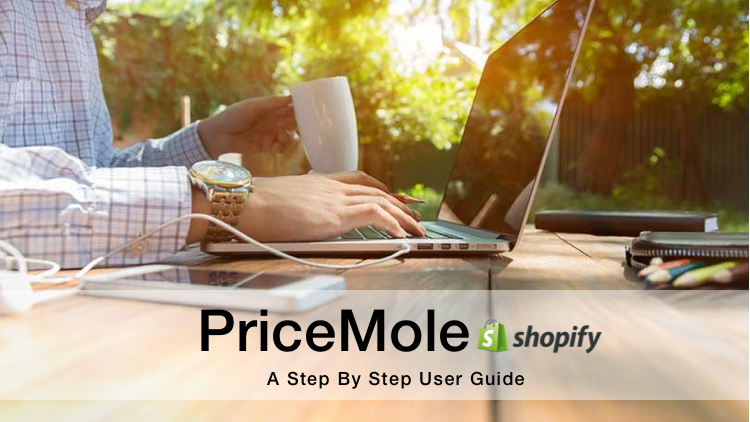 To learn more about PriceMole, visit the PriceMole Shopify app listing or contact us for a free demo of the PriceMole app!